Describe the relationship between voltage and electric field. Derive an expression for the electric potential and electric field. Calculate electric field strength given distance and voltage. 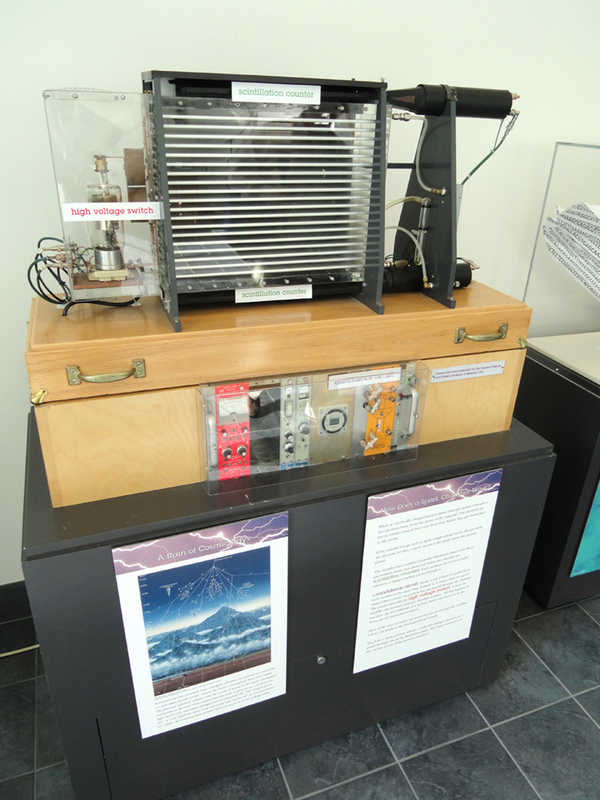 In the previous section, we explored the relationship between voltage and energy. In this section, we will explore the relationship between voltage and electric field. For example, a uniform electric field is produced by placing a potential difference (or voltage) across two parallel metal plates, labeled A and B. (See Figure 1.) Examining this will tell us what voltage is needed to produce a certain electric field strength; it will also reveal a more fundamental relationship between electric potential and electric field. From a physicist’s point of view, either or can be used to describe any charge distribution. is most closely tied to energy, whereas is most closely related to force. is a scalar quantity and has no direction, while is a vector quantity, having both magnitude and direction. (Note that the magnitude of the electric field strength, a scalar quantity, is represented by below.) The relationship between and is revealed by calculating the work done by the force in moving a charge from point A to point B. But, as noted in Chapter 19.1 Electric Potential Energy: Potential Difference, this is complex for arbitrary charge distributions, requiring calculus. We therefore look at a uniform electric field as an interesting special case. where is the distance from A to B, or the distance between the plates. Example 1: What Is the Highest Voltage Possible between Two Plates? Dry air will support a maximum electric field strength of about . Above that value, the field creates enough ionization in the air to make the air a conductor. This allows a discharge or spark that reduces the field. What, then, is the maximum voltage between two parallel conducting plates separated by 2.5 cm of dry air? We are given the maximum electric field between the plates and the distance between them. The equation can thus be used to calculate the maximum voltage. One of the implications of this result is that it takes about 75 kV to make a spark jump across a 2.5 cm (1 in.) gap, or 150 kV for a 5 cm spark. This limits the voltages that can exist between conductors, perhaps on a power transmission line. A smaller voltage will cause a spark if there are points on the surface, since points create greater fields than smooth surfaces. Humid air breaks down at a lower field strength, meaning that a smaller voltage will make a spark jump through humid air. The largest voltages can be built up, say with static electricity, on dry days. (a) An electron gun has parallel plates separated by 4.00 cm and gives electrons 25.0 keV of energy. What is the electric field strength between the plates? (b) What force would this field exert on a piece of plastic with a charge that gets between the plates? Since the voltage and plate separation are given, the electric field strength can be calculated directly from the expression . Once the electric field strength is known, the force on a charge is found using . Since the electric field is in only one direction, we can write this equation in terms of the magnitudes, . Note that the units are newtons, since . The force on the charge is the same no matter where the charge is located between the plates. This is because the electric field is uniform between the plates. where is the distance over which the change in potential, , takes place. The minus sign tells us that points in the direction of decreasing potential. The electric field is said to be the gradient (as in grade or slope) of the electric potential. For continually changing potentials, and become infinitesimals and differential calculus must be employed to determine the electric field. where is the distance over which the change in potential, , takes place. The minus sign tells us that points in the direction of decreasing potential.) The electric field is said to be the gradient (as in grade or slope) of the electric potential. 1: Discuss how potential difference and electric field strength are related. Give an example. 2: What is the strength of the electric field in a region where the electric potential is constant? 3: Will a negative charge, initially at rest, move toward higher or lower potential? Explain why. 1: Show that units of V/m and N/C for electric field strength are indeed equivalent. 2: What is the strength of the electric field between two parallel conducting plates separated by 1.00 cm and having a potential difference (voltage) between them of ? 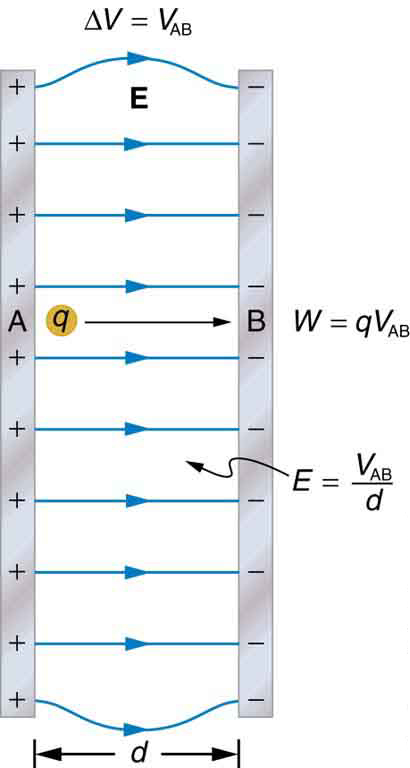 3: The electric field strength between two parallel conducting plates separated by 4.00 cm is . (a) What is the potential difference between the plates? (b) The plate with the lowest potential is taken to be at zero volts. What is the potential 1.00 cm from that plate (and 3.00 cm from the other)? 4: How far apart are two conducting plates that have an electric field strength of between them, if their potential difference is 15.0 kV? 5: (a) Will the electric field strength between two parallel conducting plates exceed the breakdown strength for air if the plates are separated by 2.00 mm and a potential difference of is applied? (b) How close together can the plates be with this applied voltage? 6: The voltage across a membrane forming a cell wall is 80.0 mV and the membrane is 9.00 nm thick. What is the electric field strength? (The value is surprisingly large, but correct. Membranes are discussed in Chapter 19.5 Capacitors and Dielectrics and Chapter 20.7 Nerve Conduction—Electrocardiograms.) You may assume a uniform electric field. 7: Membrane walls of living cells have surprisingly large electric fields across them due to separation of ions. (Membranes are discussed in some detail in Chapter 20.7 Nerve Conduction—Electrocardiograms.) What is the voltage across an 8.00 nm–thick membrane if the electric field strength across it is 5.50 MV/m? You may assume a uniform electric field. 8: Two parallel conducting plates are separated by 10.0 cm, and one of them is taken to be at zero volts. (a) What is the electric field strength between them, if the potential 8.00 cm from the zero volt plate (and 2.00 cm from the other) is 450 V? (b) What is the voltage between the plates? 9: Find the maximum potential difference between two parallel conducting plates separated by 0.500 cm of air, given the maximum sustainable electric field strength in air to be . 10: A doubly charged ion is accelerated to an energy of 32.0 keV by the electric field between two parallel conducting plates separated by 2.00 cm. What is the electric field strength between the plates? 11: An electron is to be accelerated in a uniform electric field having a strength of . (a) What energy in keV is given to the electron if it is accelerated through 0.400 m? (b) Over what distance would it have to be accelerated to increase its energy by 50.0 GeV? 5: (a) No. The electric field strength between the plates is , which is lower than the breakdown strength for air . 19.2 Electric Potential in a Uniform Electric Field by OpenStax is licensed under a Creative Commons Attribution 4.0 International License, except where otherwise noted.